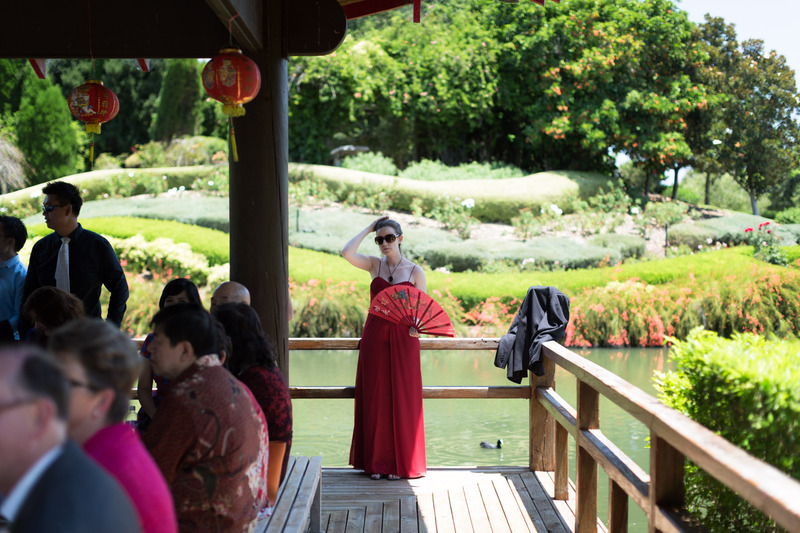 After the ceremony, everyone was up and milling about, either casually chatting away to each other or trying to catch a glimpse of the rare bride-and-groom-emon*. Aunt Artemis (L) & Uncle Ado (R). 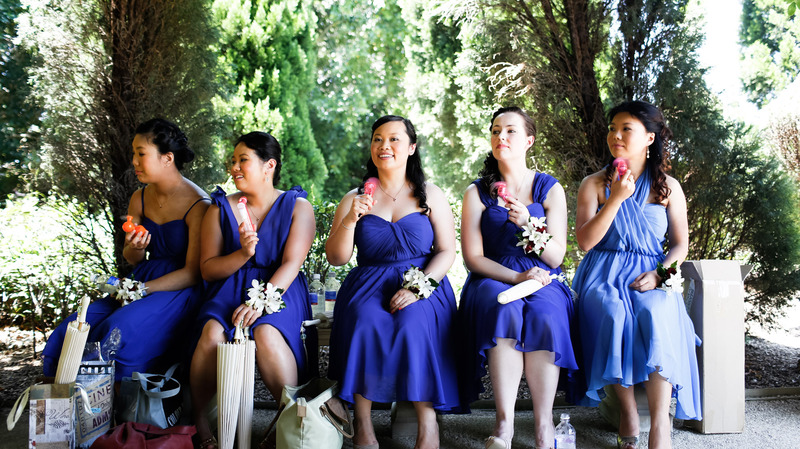 At some point, my photographers managed to catch all my girls doing this (or staged it? I don’t know). I’m not too sure when this happened, but I know I love it. I love it lots. The photographers also managed to get this whopper of a photo. I don’t know how they did it. They just did. 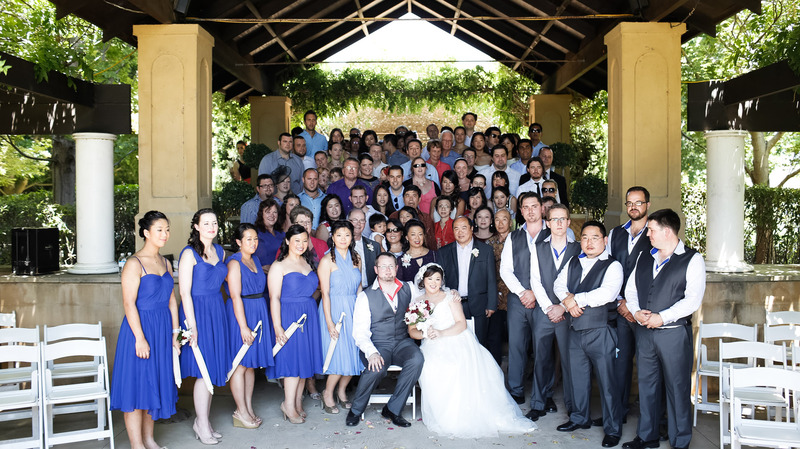 Yes, that is every.single.guest that was at our ceremony. My friends also managed to wrangle Mr Big and I for a group shot. Don’t you love our synchronised head-cocking? / Photo by Friend Sahara. Once we got underway, I requested MoH M&MS and GM Iron to get everyone in order. I would’ve done it myself, but I had a long train and well… it’s hard to walk around and be bossy when you’re constantly having to literally flip to turn yourself around (it’s also hilarious). Is it bad that I absolutely love this picture? From L to R: Mumma Big, De Papa Big, Mama Bighorn and Papa Bighorn. Half of my Indonesian family! 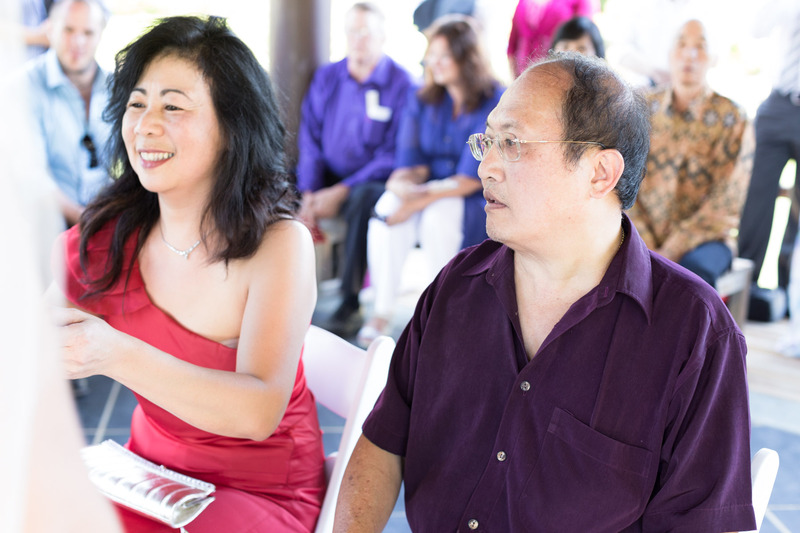 Uncle Phung, Auntie Pin, Auntie Men, and Uncle Chung. After a little bit, however, we decided that it was time to start, missing party or no. 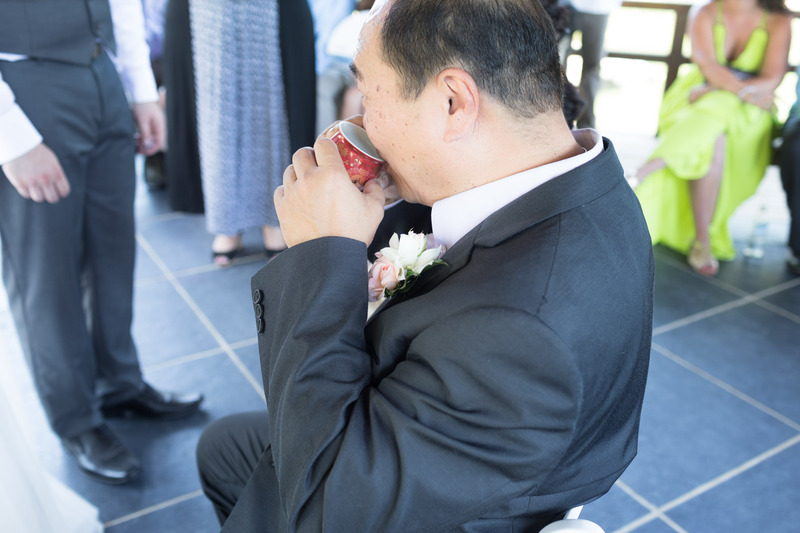 I was originally going to introduce the concept of the Chinese Tea Ceremony to the audience, but decided GM Iron – who had performed one at his own wedding – would do a better job. 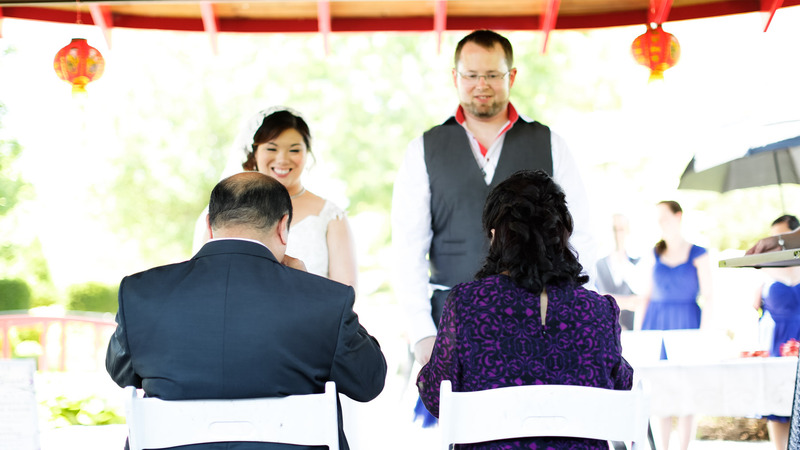 After a brief introduction, it was up to MoH M&Ms to announce who would be coming up to the two chairs set out in the middle of the Pagoda. 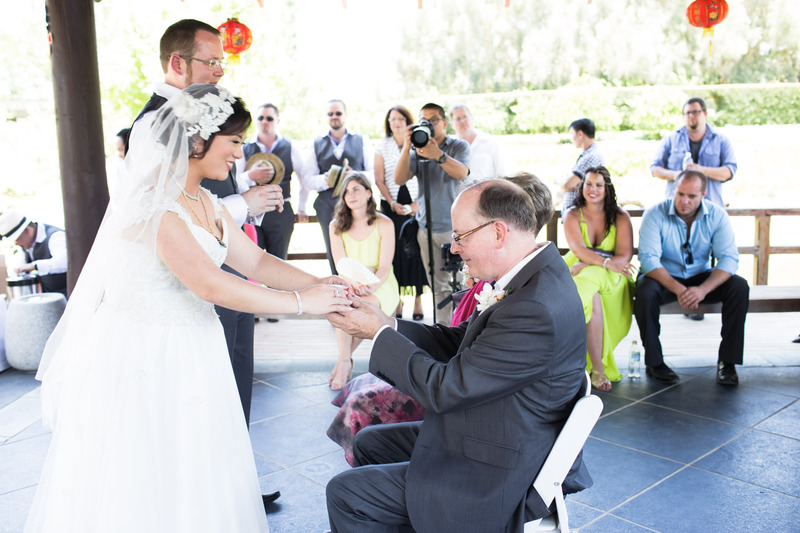 … and then we take the tea cups back with a bow. At this point, my parents would then gift us. 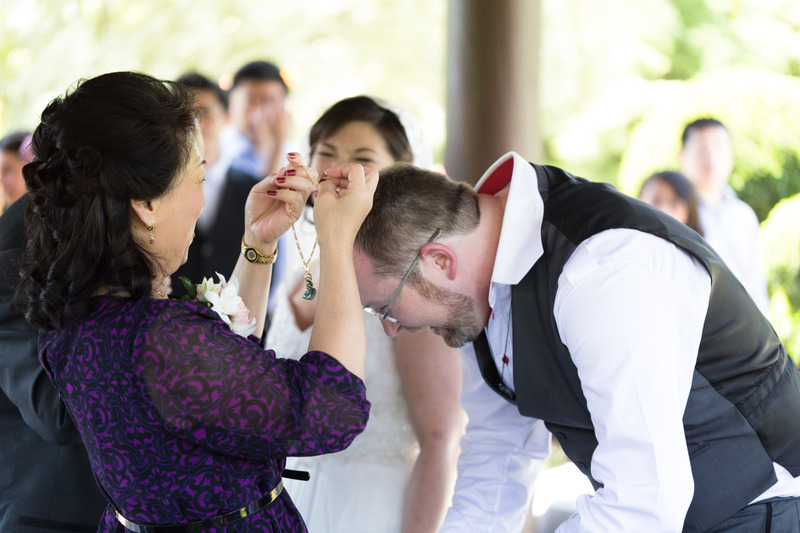 Remember guys, jewellery is immediately placed on the bride and groom, and my parents gave us a beautiful gift which merged New Zealand jade with Indonesian gold. Absolutely stunning guys! Mr Big is too tall! It was a bit of a struggle to get through my parents’ serving, simply because there were things we encountered that my parents, myself, or Mr Big hadn’t counted on. For example, Mr Big had to get his glasses off to get the necklace on. 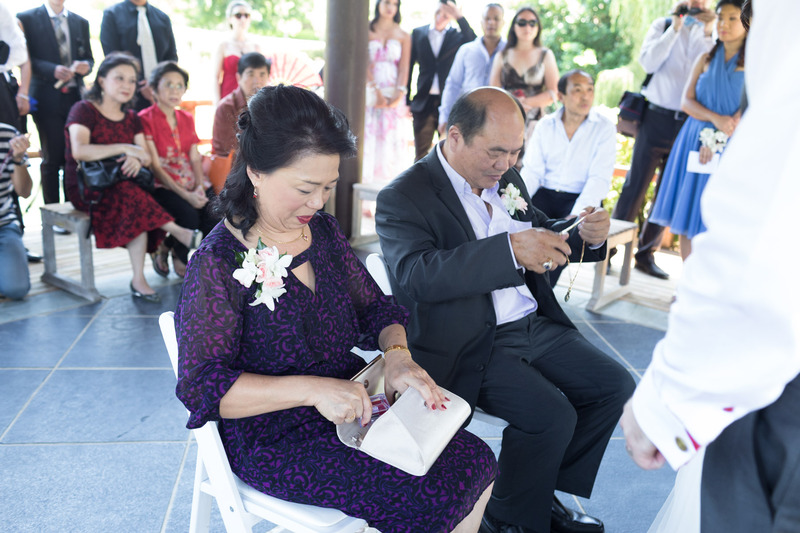 Meanwhile, Papa Big was struggling to get the necklace on over my gigantic hairdo so he had to unclasp it. But no matter crisis solved! 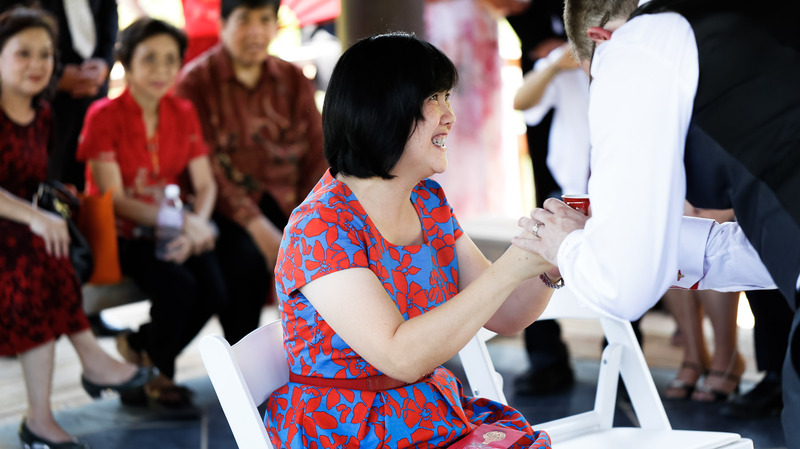 It should be noted that there were a whole lot of people working behind the scenes to ensure that the Tea Ceremony went smoothly, namely my fabulous bridesmaids and Lady Luck, our ‘good luck lady’. GM The Flash and GM NB were also doing an awesome job keeping my girls out of the sun. GM The Flash – ever the gentlemen. See that lovely lady in grey, holding the tray (Cat, bat, sat, hat)? She was our “Good Luck Lady” and also GM Xboy’s lovely wife. She was responsible of handing the tea to us and then taking it away. Isn’t she awesome? Meanwhile, after my parents, it was Mr Big’s parents’ turn, which flowed a lot smoother now that we had one serving under our belt! My Uncle B, the oldest of my uncles and brother of Papa Bighorn, and Aunt D.
My Aunt C and Uncle L, second oldest uncle and brother of Papa Bighorn. My Uncle D, cousin of Papa Bighorn and next oldest uncle. Uncle Chong (L) and Aunt Men (R) being served, oldest aunt and sister of Mama Bighorn. Also my godmother, hence the next photo! Serving Uncle Phung and Aunt Pen, second oldest aunt and sister of Mama Bighorn. Aunt Lee, youngest aunt and sister of Mama Bighorn. Her husband couldn’t attend the wedding. Serving both Uncle Ado (not shown) and Aunt Artemis (shown). Uncle Ado is the older brother of Mumma Big and Aunt Artermis is the youngest sister of De Papa Big, but we combined the two for ease (and time’s) sake. With all the elders served, it was time for more photos! Next up, our group photos are constantly photobombed. * To those who don’t get the reference – Pokemon. ‘Nuff said. 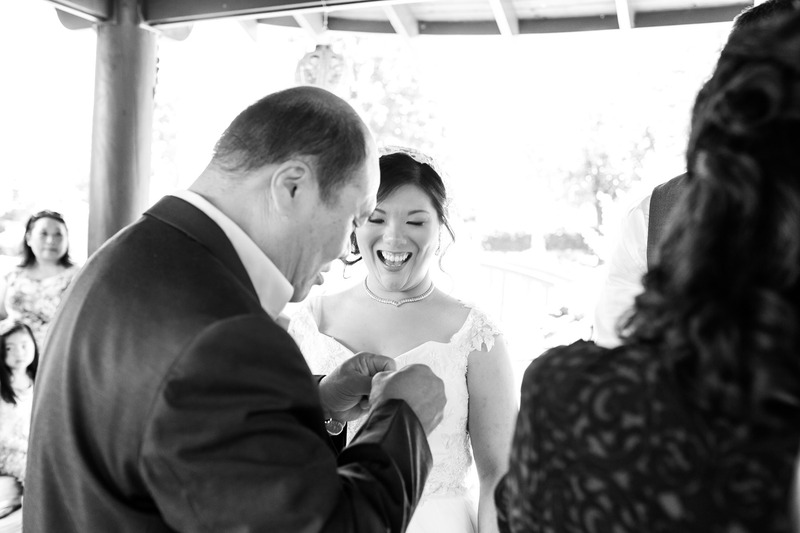 Laugh, weep, and celebrate with us by watching our wedding video. We have a “nice” morning of Car-Tetris fun! I tell you guys about the frenzy that is the lead-up to our wedding day. We practice walking and talking. We eat a loooooot of meat. I celebrate my last night as a Miss. I talk to you about a major wedding regret. The girls get their pretty on. The guys clean up nicely. I get all fancy with my duds. I walk down the aisle. We give each other a big smooch! We autograph our marriage certificate and are presented as husband and wife. 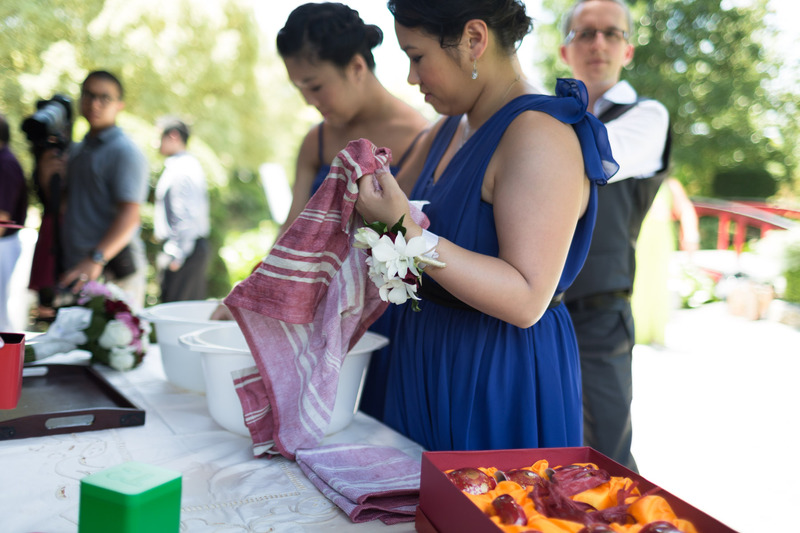 Part 2, Wedding Traditions: Something, Something. 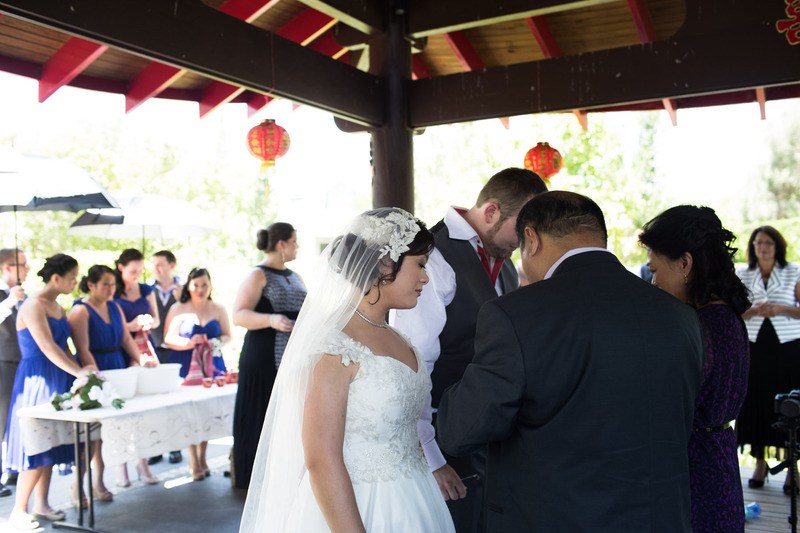 In a previous post, I talked to you guys about Chinese wedding traditions that we’ll be including in the wedding. I also talked about the Chinese tea ceremony and it’s importance (and I may have overused the Jared Leto gif, just a bit). 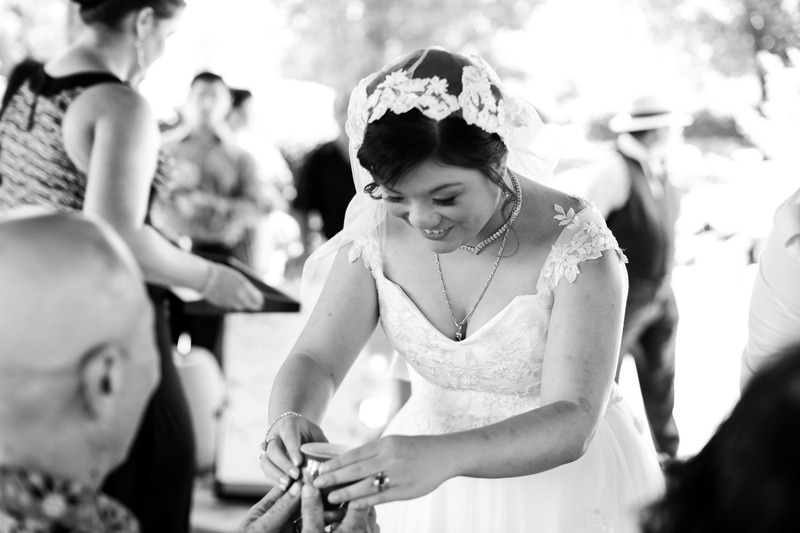 In this post, I’ll talk about the “Western” wedding traditions that we’ll have at the wedding. 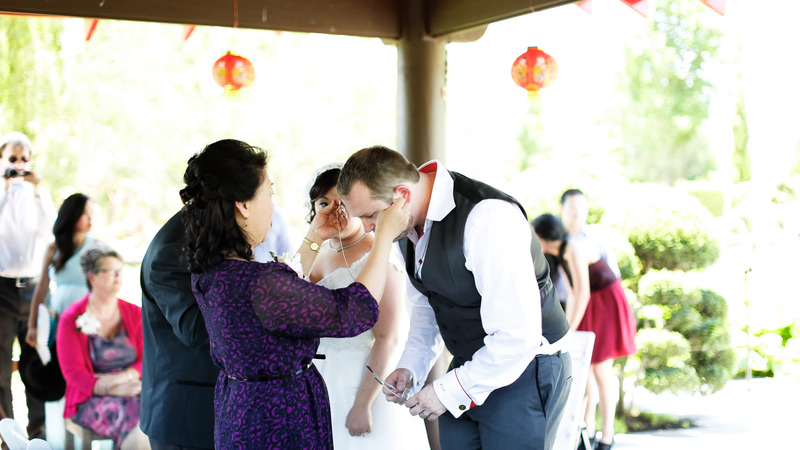 Unlike the Chinese traditions, we’ll only have a few key “Western” traditions for our wedding. Mr Big’s parents are too traditional and Mumma/MIL Bighorn doesn’t have any Dutch traditions that she wanted doing. This is a quintessentially Western tradition and originated during the time when arranged marriages were common. The betrothed couple weren’t allowed to see each other as marriages during this period (read: the Medieval land-owning period) were mostly seen as a “business deal”. The father of the bride wanted his daughter to marry a rich man, but feared that the groom would annul the marriage if he saw the bride before the wedding because he thought she was too unattractive. The veil that a bride wears served a similar purpose. Nowadays, this tradition is less about the fear that the groom wouldn’t want to marry the bride, and more about the fact that it’s a “tradition you must have”. 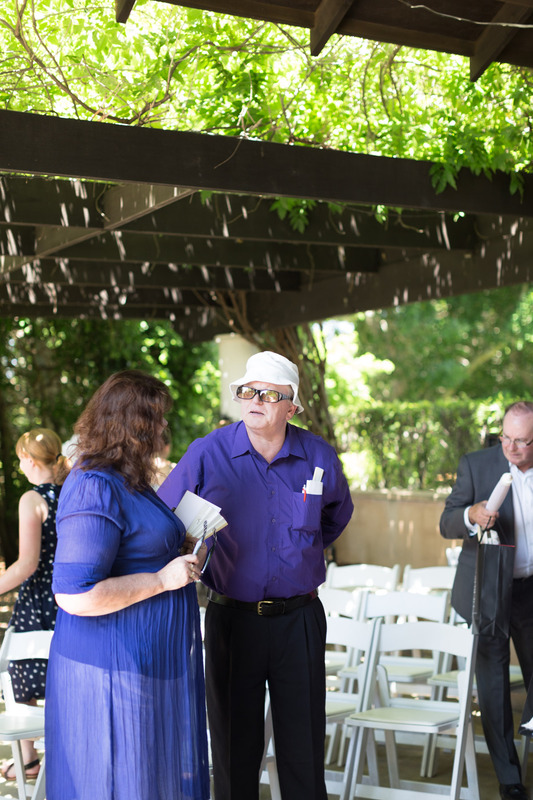 There’s also the belief that it’s bad luck to see the bride before the ceremony (and my parents are all about luck). It’s also believed to add to some sort of excitement leading up to the ceremony. However, more and more couples are doing a “first look”, or seeing each other pre-ceremony to take formal bridegroom portraits. Mrs Panda’s First Look. 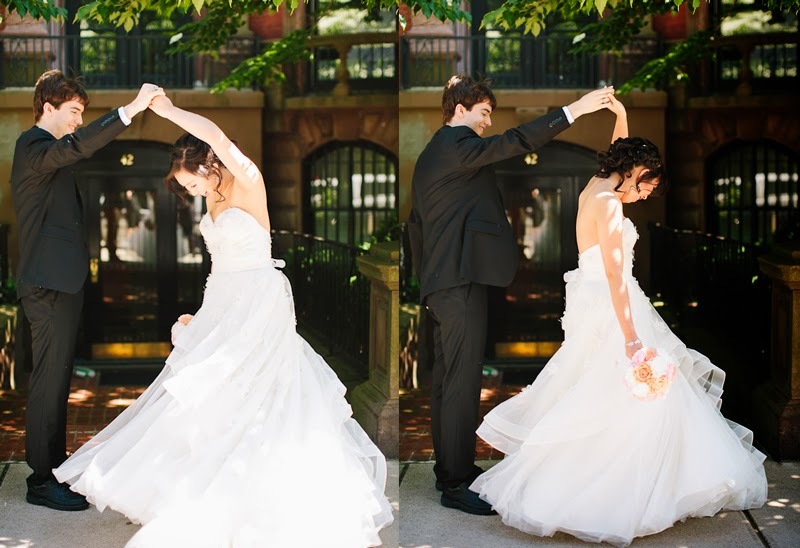 I love that twirl! Photography via Lisa Rigby Photography. The reason we’re keeping with this tradition is because Mumma/MIL Bighorn really wanted it. It’s basically the only tradition she seems to want to use, so I’m more than happy to oblige! This is why Mr Big will be blindfolded during the ‘auspicious time’ tradition mentioned in my previous post, so he can’t see me before the ceremony. We’ll also, hopefully, be getting pretty pictures of a blindfolded and suited up Mr Big and dolled up Miss Big in her white wedding dress. I won’t be bothering with the last line, since it’s not a common part of the poem that most people know of, but I’ve been trying to think of my “somethings”. “Something new” is an easy one – my dress, my veil, my shoes, and more. In Chinese weddings, it’s customary to buy “new” things, so most of my attire will be brand-spanking new! My ‘something new’ was therefore a no-brainer. My “something borrowed” is a necklace belonging to my ma, Mama Bighorn. It’s a silver necklace which has an almost yellow sheen to it, to match the yellow gold of my ring. 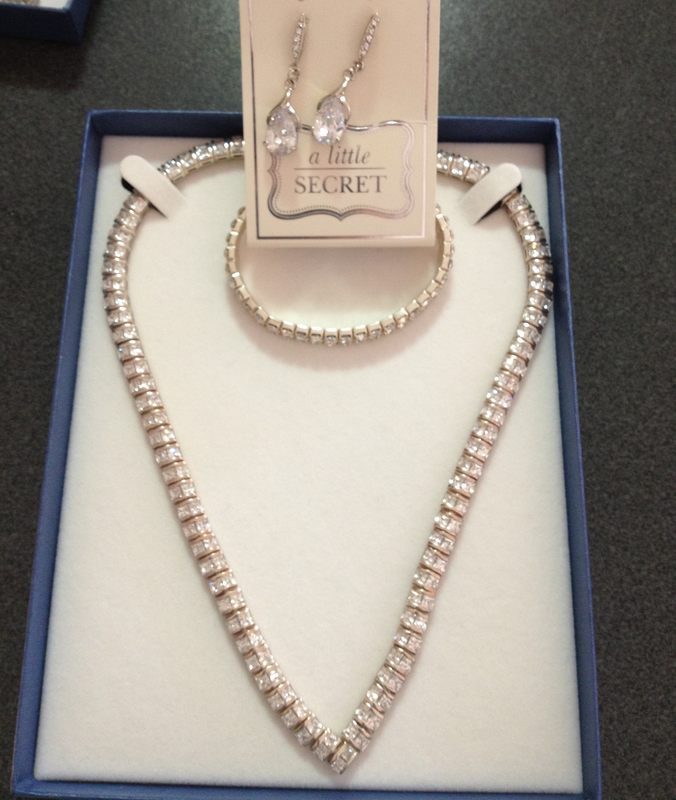 My “something borrowed”, my ma’s silver necklace. You guys also get to see my earrings and bracelet! Personal image. I tried on the necklace and it’s gorgeous. It complements my skin tone, as it has a soft yellow sheen to it, and will look perfect with my dress! I can’t wait to wear it on the Day. Now the last two were the difficult ones. 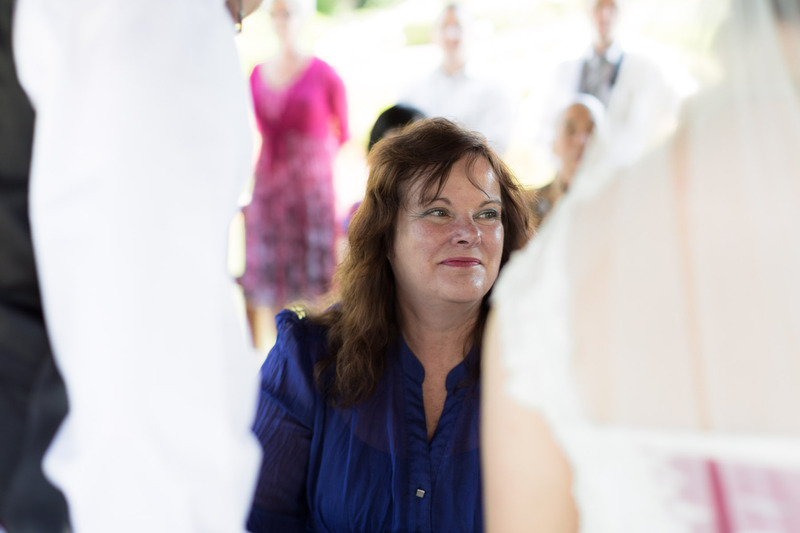 As my mother was wed in Indonesia, and her wedding was mostly controlled by an overzealous mother-in-law, she didn’t get to buy a wedding dress or anything that could be considered sentimental. As a result, I don’t have anything from her wedding but the pictures. So my “something old” was difficult to pinpoint. As for my “something blue”, I had no idea what to use! The ideas ranged from a garter, to a Portal charm to hang off my bouquet, to an earring for my second piercing on my left lobe. All of those meant I had to buy stuff though, and I couldn’t bring myself to pull the trigger on those ideas. Today, however, after chatting with Mama Bighorn about different traditions, she mentioned that she may have something which might prove useful. Isn’t it pretty? ❤ Pardon the bad nails! Also, that’s Mr Big’s leg! Personal image. It’s not what most would consider “old” (it’s only 15 years) but it’s gorgeous and blue and belongs to Mama Bighorn. 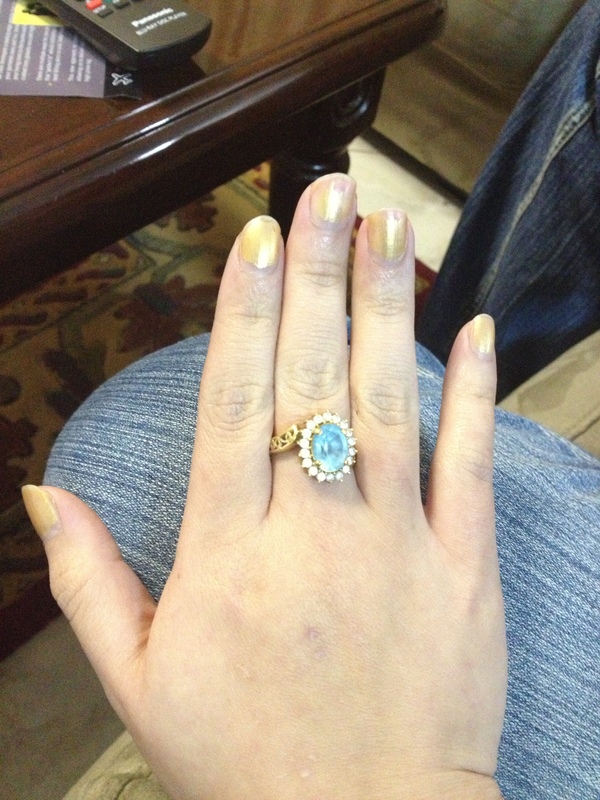 She’s bequeathing it to me since she has another sapphire ring which my papa gave to her five years ago. 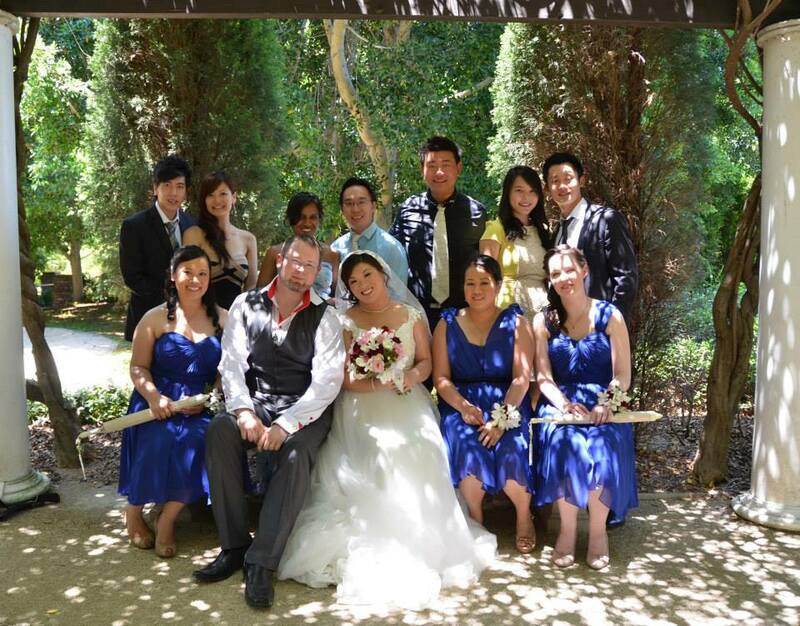 So there you have it – my something old, new, borrowed and blue! 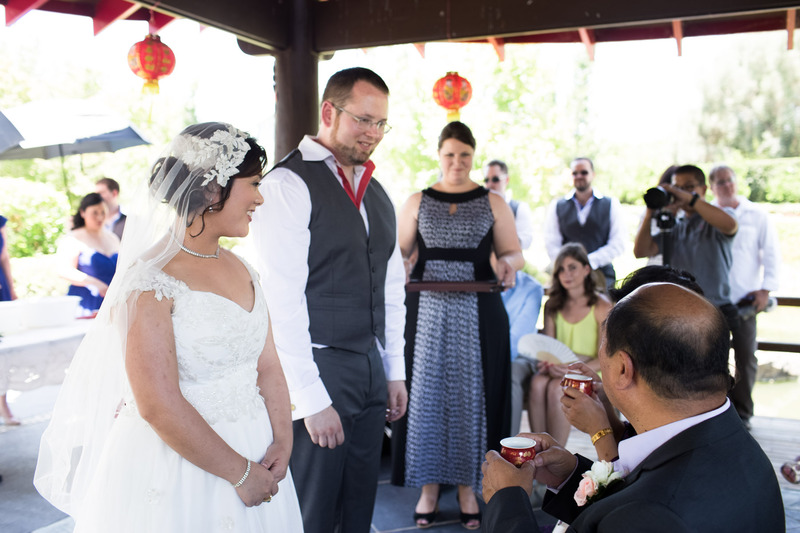 Part 1, Wedding Traditions: Culture Shock! Ever since I became engaged, I’ve been thinking about certain traditions which I would like to incorporate into mine and Mr Big’s wedding. Mr Big is quintessentially a Kiwi with some Dutch in him, and so didn’t really have anything to put forward. When I asked his parents, they were also very easy-going about traditions as well, and didn’t have much to put forward either (except for one, which will be talked about in more detail in the next post!). As an atheist, Mr Bighorn also doesn’t have any spiritual or religious traditions that were significant to him. 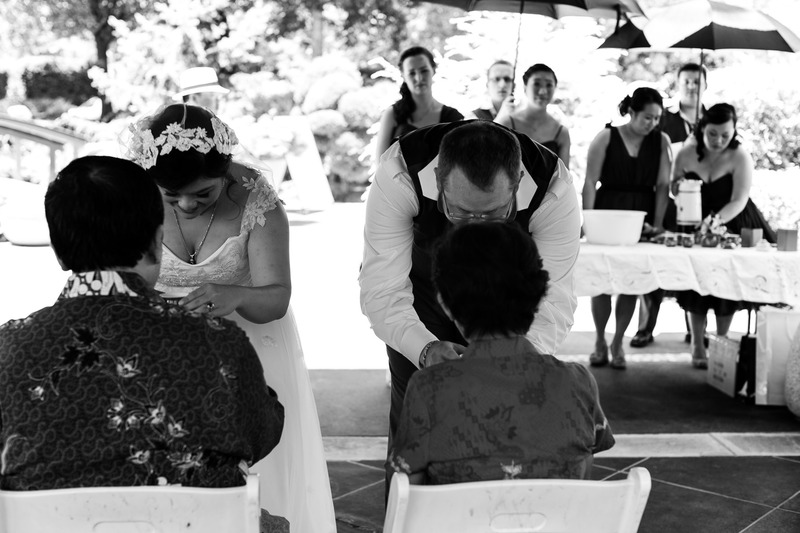 As a Buddhist myself, I also didn’t really have any religious traditions for the wedding (although, funnily, a lot of people assumed we’d get married in a temple). 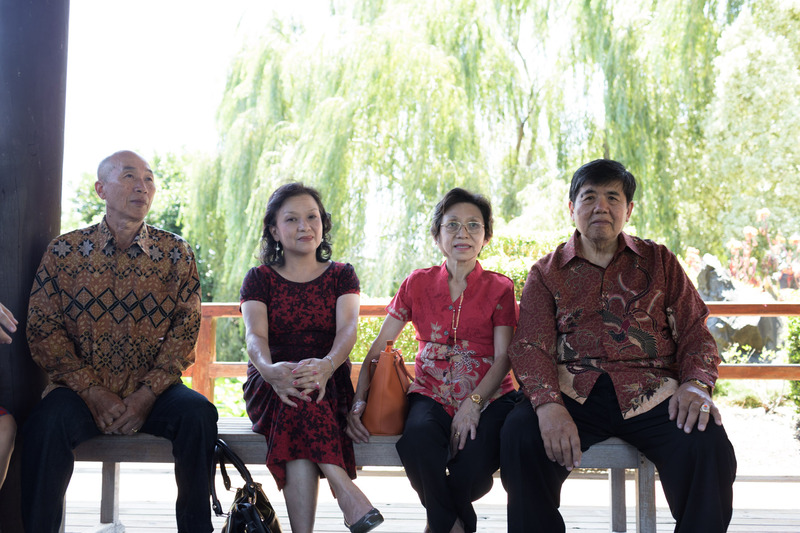 As I was born and raised in Australia, despite my Chinese heritage, and my parents having originated from Indonesia, I wouldn’t necessarily call myself traditional. However, my parents definitely are, and during the early (and much later) parts of our planning, have pushed particular traditions onto both Mr Big and myself. Because of this, Mr Bighorn and I suffered from what one could call ‘culture shock’. Urban Dictionary defines ‘culture shock’ as ‘the shock of moving from one culture to another, often associated with laws, traditions, food, music and general lifestyle choices‘. We couldn’t believe the amount of traditions we needed to do! 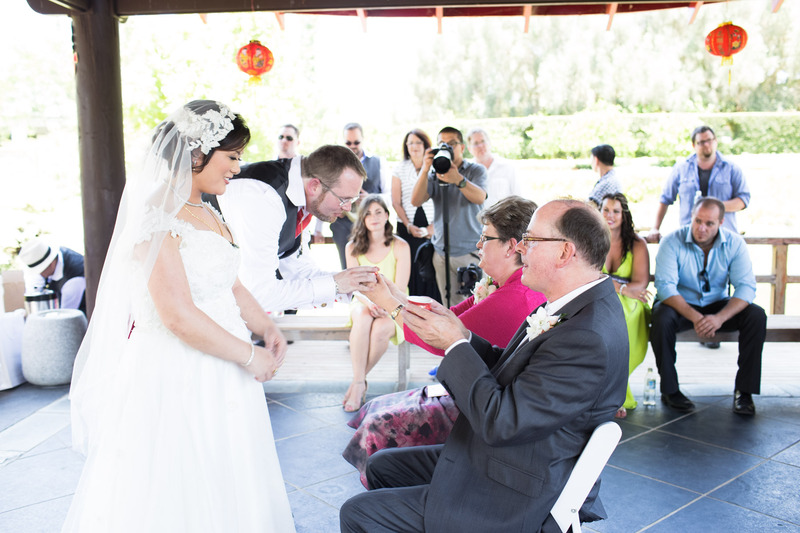 It baffled us, but after doing some research, I’ve come to find that Chinese wedding traditions are filled with symbolism, all to do with either respecting Elders or bringing some form of happiness (joy, luck, prosperity) to the newlywed couple. The word “auspicious” means “promising success”, and therefore, the auspicious date promises the couple success in their marriage. 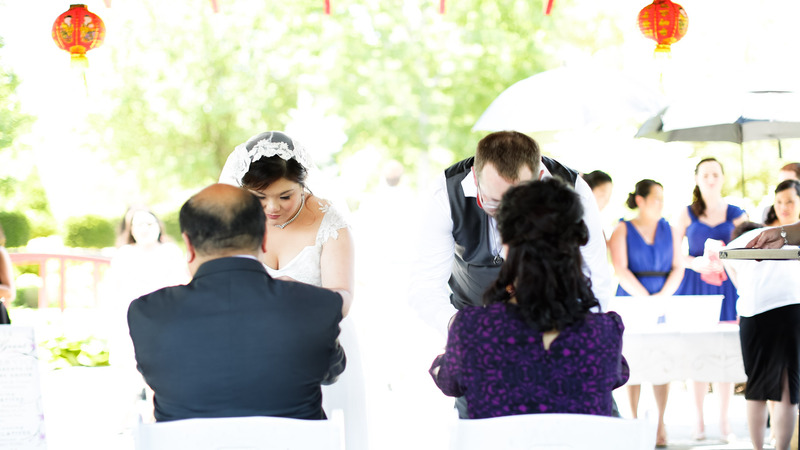 Therefore, by being married on the auspicious date, the couple will have a good marriage. 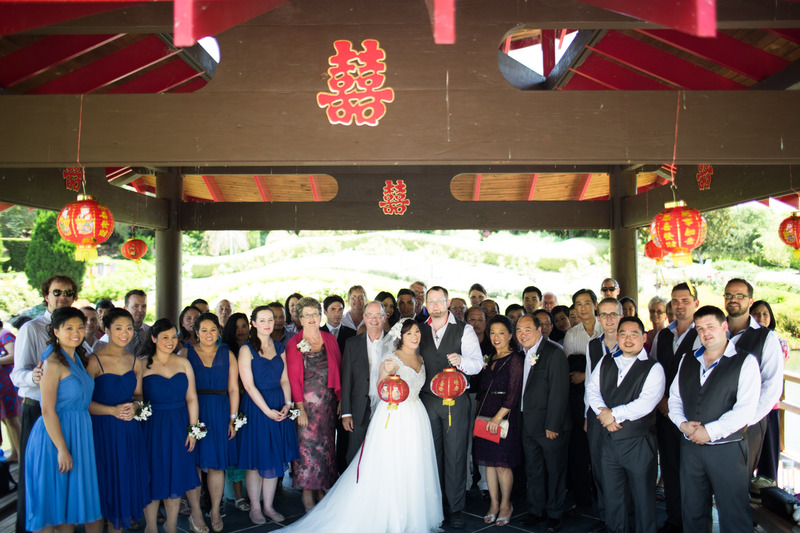 In Chinese culture, the bride and groom’s birthdays (time and date of birth) were typically used to find a date that would be considered the most “auspicious” – bringing them good luck and prosperity in their union. Unfortunately, the date needs to be figured out by a Chinese “soothsayer”, and the only two who ‘serve’ my family live in Indonesia and Thailand. That meant constant International conversations through 5 million grapevines (I may be exaggerating here). This tradition gave both Mr Big and I stress and constant headaches, but we stuck it out, as we both knew how important it was to my parents. The whole process took approximately 6 months, as the soothsayers told us that, as we got engaged so “early” we couldn’t get a date in 2013/2014 until much later in the year. The only dates they were giving us were late 2012, and Mr Big and I wanted a long engagement. So waiting we did. We finally got our date in September 2012 and the date ended up being close enough to a February 2014 wedding that we were ok with it. For those brides out there whose parents are wanting them to get auspicious date, try to stay patient and stick to your guns. I gave my parents an ultimatum at 6 months – if we DIDN’T get a date by 6 months, we would either: a) try to find our own soothsayer, or b) try to calculate the date ourselves (there’s a great app that does it for you!). 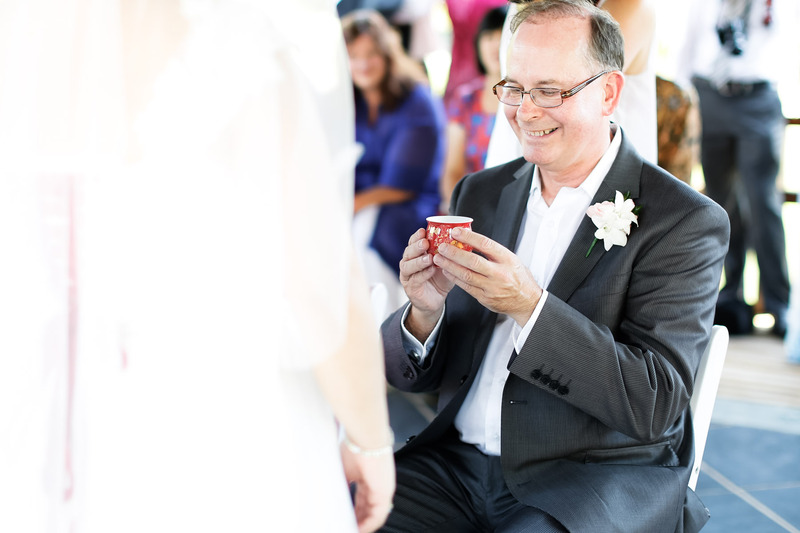 This tradition will take place on the morning of the wedding and is symbolic of my family, and more specifically, my eldest sister, MoH M&Ms, “letting me go”. This is because, in Chinese culture, it’s customary to ‘get married in order’, so M&Ms is supposed to be married before I, however, as this isn’t 16th Century China, that just didn’t happen. I’m the second-born of three daughters in my family, making me the middle child. My eldest sister, MoH M&Ms, has a boyfriend, but she isn’t married. To counteract the fact that I’ll be getting married first, I have to be “let go” by the unmarried eldest. 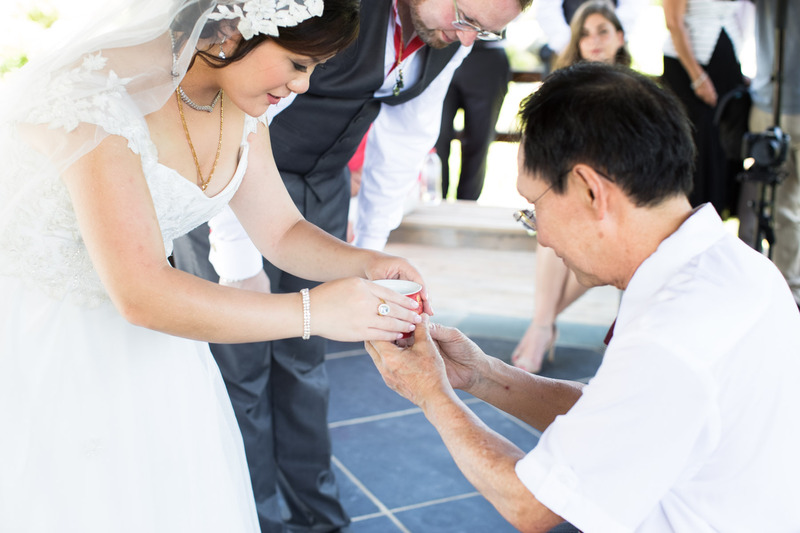 This tradition, like the auspicious date, is meant to give the bridegroom couple good fortune. With this tradition, a certain time is appointed to the bridegroom couple in which the groom must pick up the bride from her parents’ house and take her to his parents’ house. This tradition has given us the most grief, as it was only brought up later into planning, and therefore, became something of a logistical nightmare. The three things that made it difficult for us was: the fact that our wedding was in the Hunter Valley, and therefore, nowhere near my parents’ house (in Sydney) and Mr Big’s parent’s house (in Christchurch, New Zealand); we wanted to keep the tradition where Mr Big and I don’t see each other until the ceremony; and finally, our ceremony is supposed to be starting at 11AM in the Gardens, and that was the exact time that we were given to enact the traditional “picking-up-of-the-bride”. We were able to get around these problems, but to say it didn’t cause Mr Big and me grief would be lying. My tip to those who need to do the auspicious time tradition would be to get a clear idea early into wedding planning so that you know what you need to do. If you have to pester and prod, pester and prod! 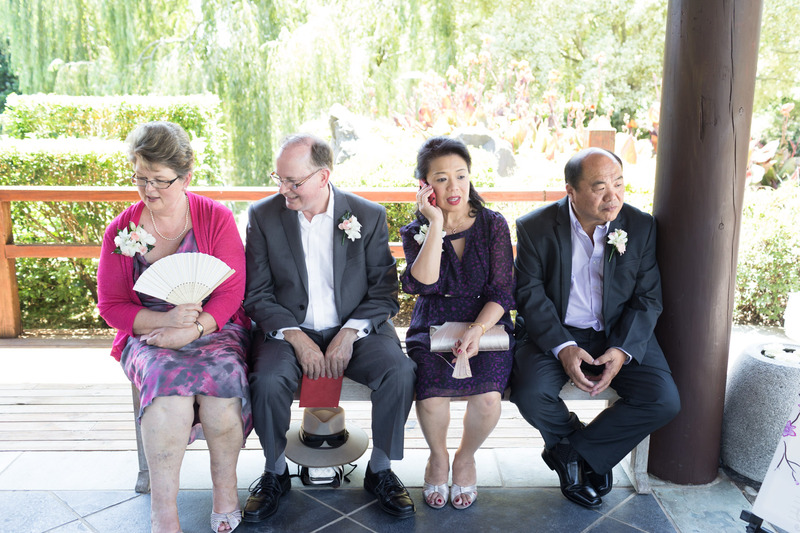 Problem: Our wedding is in the Hunter Valley, my parents’ house is in Sydney, and Mr Bighorn’s parents’ house is in Christchurch, New Zealand – how do we do this tradition? Solution: Because we were having a “destination” wedding, my parents compromised with this. Instead of Mr Big picking me up from my parents’ house in Sydney, New South Wales, Australia and (literally) flying to Christchurch, New Zealand, Mr Big would pick me up at the place of accommodation where my parents would be staying. The most important part of the tradition was that Mr Big would take me away, so all he really has to do is take me over the threshold of the villa to the outside. Problem: The time the tradition needs to be performed is at 11AM – our ceremony starts at 11AM! Solution: We’ve been told by a gazillion married couples already that it’s ok for the bridegroom couple to be late to their own wedding, as long as both of them are late at the same time. We’re approximating we’ll be about 15 minutes late to the ceremony, so it’ll officially start at 11:15AM. I’ve asked the venue if we’re allowed to push our timing back 15 minutes and they were very accommodating. We’re also going to ask our celebrant to also announce that we’ll be late if it so happens that we are. Problem: We’ve agreed to not see each other before the ceremony – or at least, Mr Bighorn is not meant to see me before the ceremony. But the tradition means we have to see each other before the ceremony! What people have dubbed the “Not First Look”. Sigh, so pretty… / Image courtesy of thebridaldetective.com, photography by Jill Lauren Photography. Though this has given us the most grief, we’ve made our peace with it, and are even taking advantage of it! Hopefully it all works out. I’ve mentioned that we’ll be having a Chinese tea ceremony in a previous post and I’ll be explaining what this is in some detail in another post. Logistically, this is giving Mr Big and I the most grief, as it’s dependent on certain key members and we’re having a hard time pinning the timing of these guys down. Otherwise, Mr Big and I were more than happy to include this. 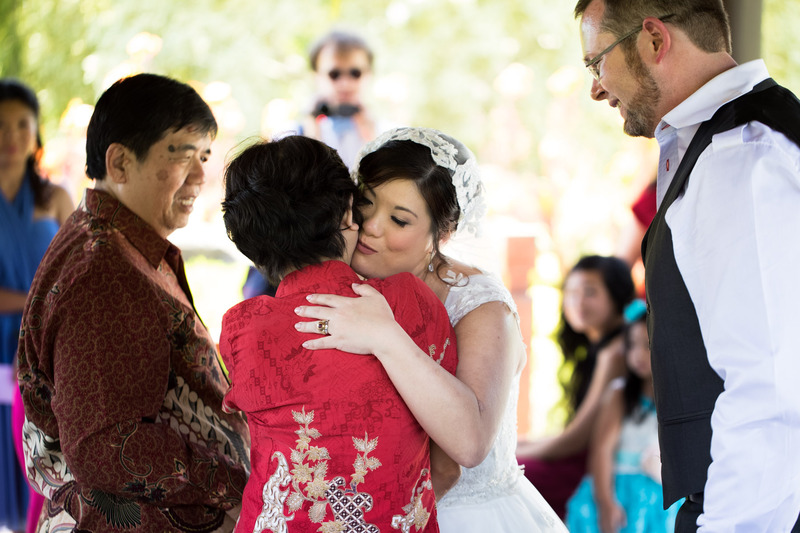 We love the tradition behind it, and being from a Dutch and Chinese family respectively, it was important we celebrate our connections with our elders as much as the connection between ourselves. 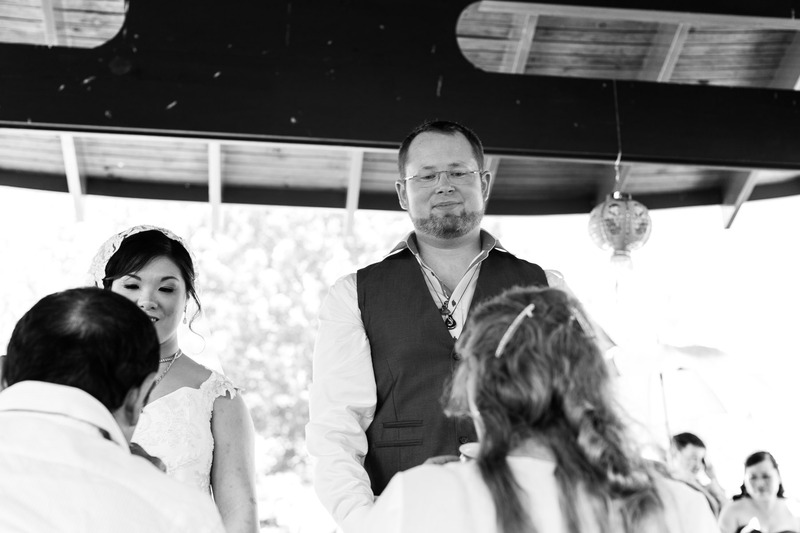 Again, I’ll be explaining these in more detail, but it’s a beautiful ceremony! Mrs Toucan’s beautiful Chinese tea ceremony. Photography by Robert Mirani. 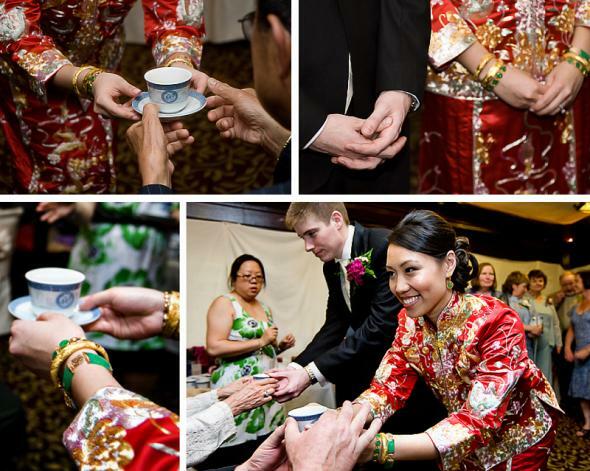 And those are the Chinese wedding traditions! We’re excited about some, like the Tea Ceremony, and a little bit anxious about others, like the auspicious time tradition. But we’re both hoping it’ll all work out in the end. With enough planning and contingencies, Mr Big and I have made sure that anything that can go awry will be handled. 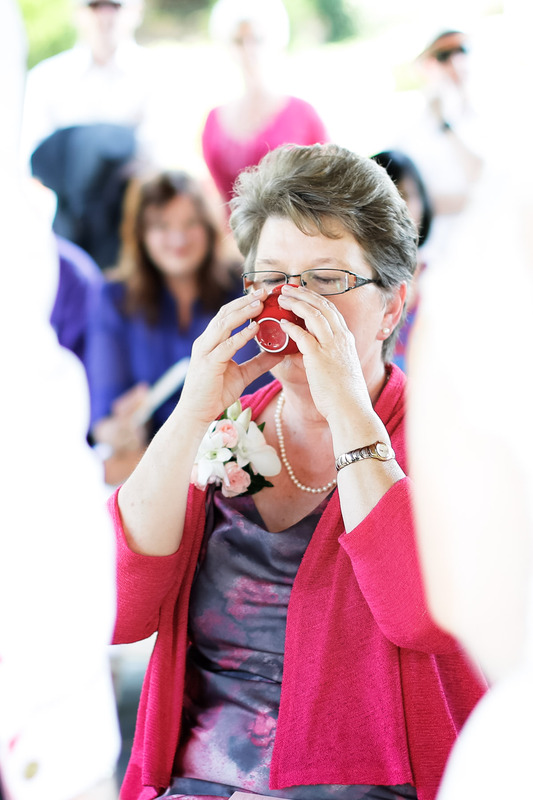 In my next post, I’ll talk about the more “Westernised” wedding traditions we’ll be having! On a Saturday morning, June 29, I woke up and came downstairs, seeing Mr Big bent over a writing pad and planning out the day-of timeline. A little early for that, doncha think? So I asked what that was about, and found out something that made my heart sink. Apparently, Chinese tradition states that Mr Big needed to lead me out of my parents’ house at 11AM. Now this meant, at 11AM, Mr Big needed to get to my parents’ house and lead me out. There were initial problems to this. The first problem is fixable. Let’s say Mr Big is at the door to my parent’s villa. If he leads me out, he’ll see me in all my white-dressed-glory, which ruins the whole “first-seeing-each-other-when-I-walk-down-the-aisle” thing. 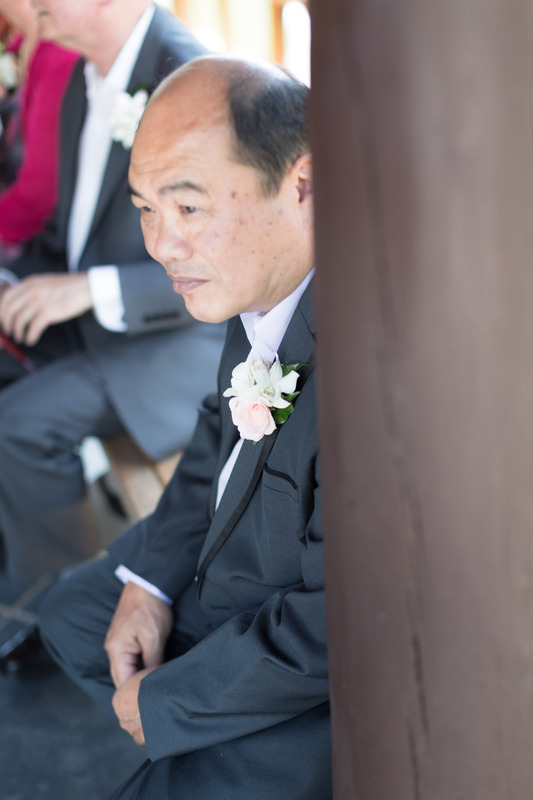 GP says that he can blindfold himself before he knocks on the door and we can do both traditions (not seeing each other before the aisle-walk, AND the Chinese tradition of Mr Big letting me out of the house). So… this problem is fixed, but the BIGGEST issue was the second one. 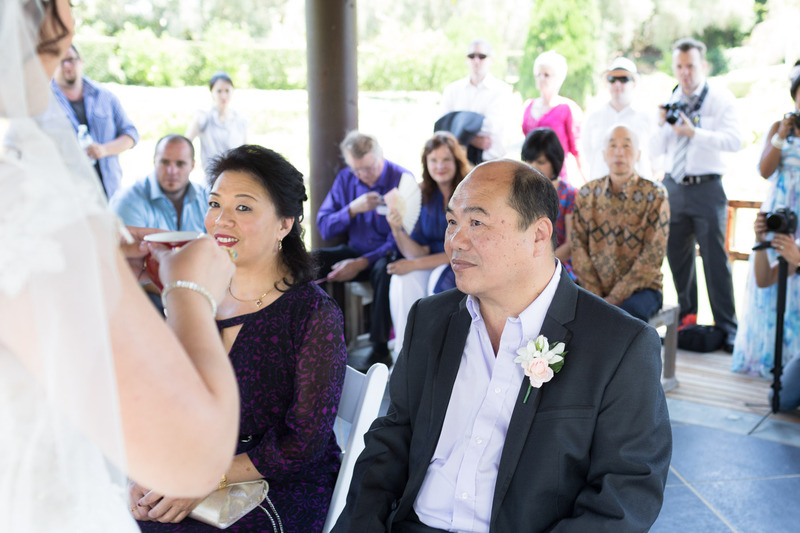 Our civil ceremony was initially supposed to start at 11AM and we’ve told our guests this. This meant guests would be arriving at the Waterfall Outlook before 11AM. Now, if Mr Big lead me out of my parents’ house at 11AM, we’d ultimately get to the Hunter Valley Gardens by about 11:15AM. 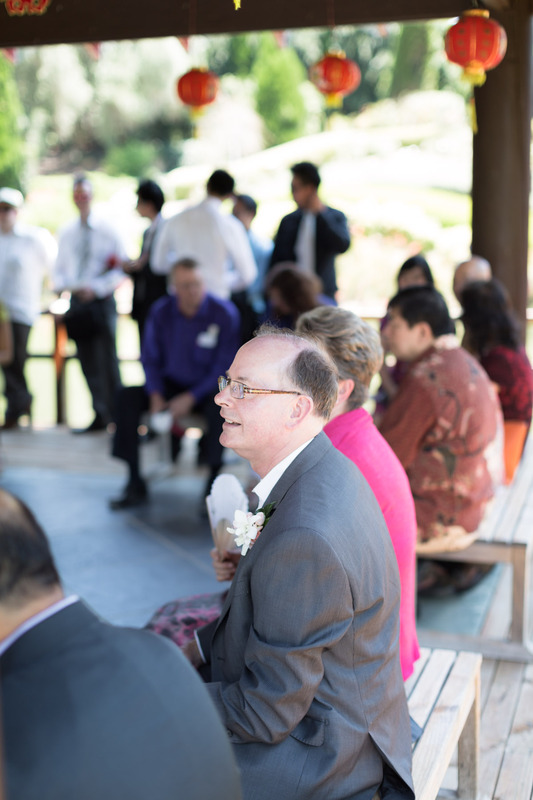 Which meant our guests would be sitting down waiting around for about 15-20 minutes. I didn’t want that to happen. 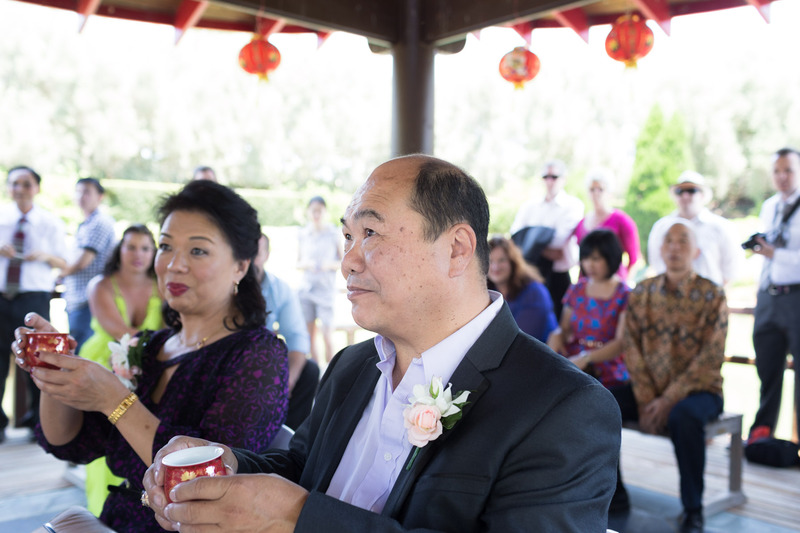 Not to mention that pushed back the civil ceremony, the official family photos, and the amount of time we get for the Chinese tea ceremony. 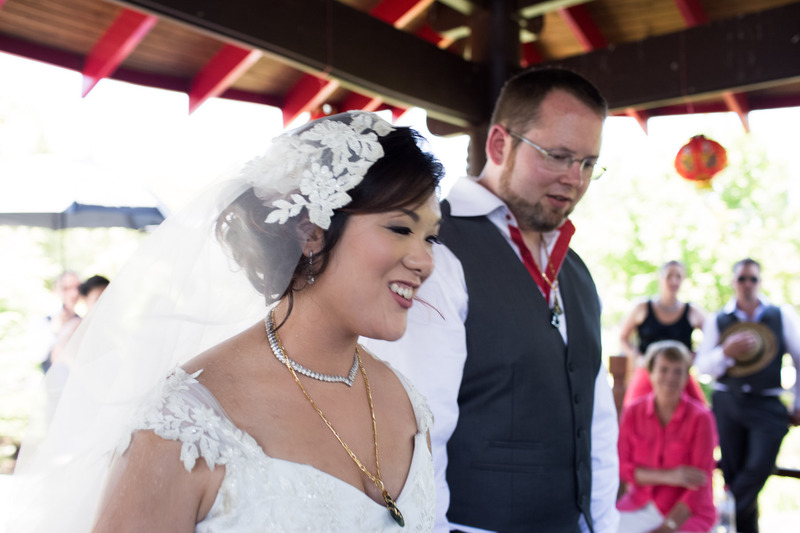 However, like all problems, we found a fix, which meant being approximately 15 minutes late to the ceremony. 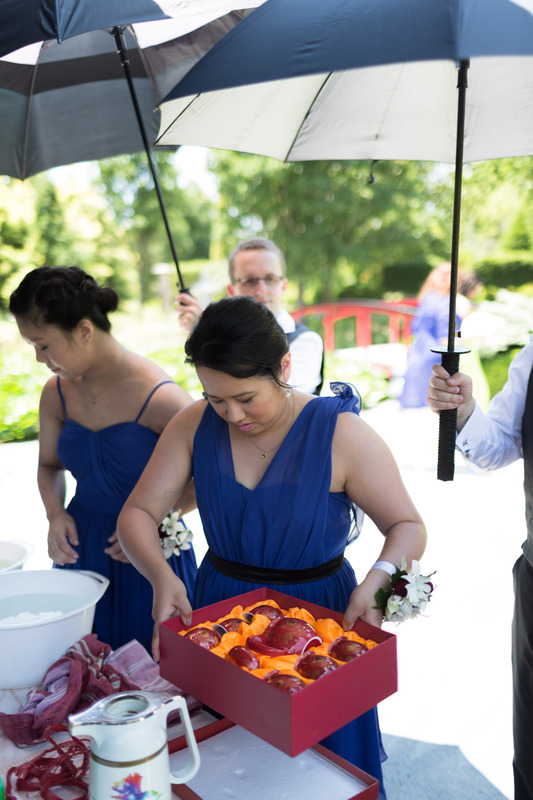 We made our celebrant aware, and hopefully, guests will be ok with it. According to a number of our married guests and friends, it’s okay for the bride and groom to be a little bit “fashionably late”. ‘But what, pray tell, is this post about?’, I hear you guys asking. Well, guys, we’re counting down the days to the wedding, and I’m glad to tell you that we’ve got the day-of timeline tightened and neat. With the help of Microsoft Project, information from our vendors, and working throughout all of November and December to get this baby all set, I think we’ve definitely got a workable day-of run sheet. Get in touch with your vendors as soon as possible: I know this is an obvious one, guys, but seriously, this vastly helped in constructing our day-of run sheet. Our reception coordinators actually gave us the run sheet that they normally work off of, and that gave me a good idea on how to get started. I basically extrapolated this and then overlaid it with our own plans. Communicate with your FI/partner: Another obvious one, but the amount of times I’ve put a plan into action and had Mr Big either improve on it or add details I didn’t know about are amazing. Mr Big and I are pretty good at communicating, and when it came to the timeline, it’s amazing what sitting down and going through it can do. Durations are your friend: I know it’s not really easy to get things down to the finest minute, but I found that giving events a duration of time (1 min, 30 mins, 1hr, 3hrs, etc.) allows for a much easier “block” to work around. For example, I know the ceremony will start at 11AM to 1115AM and go for approximately 30 minutes. I made note of that in the run sheet. 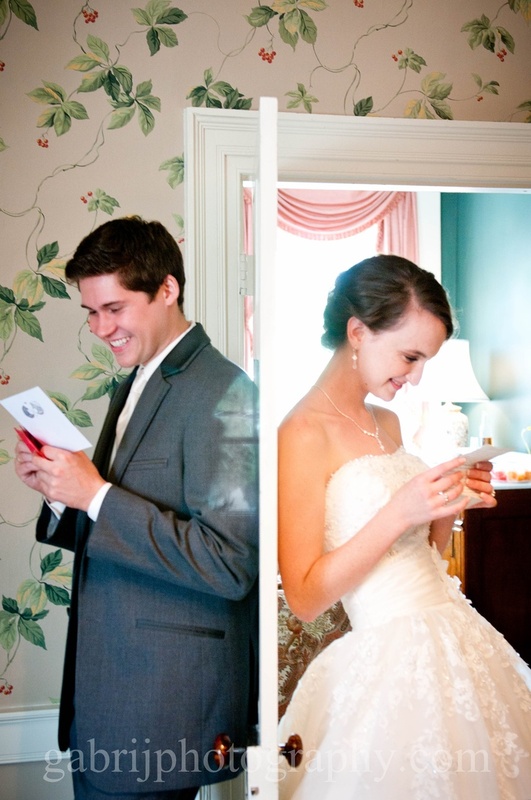 Try and go through your run sheet as early as possible with important members of the “wedding team”: I’m not just talking about bridesmaids and groomsmen – remember that your ushers, parents of flower girls or page boys, DJ, MC, florist, and all other special attendants need to know what’s happening too. I sent my preliminary run sheet to all of my vendors and asked them to have a look over it. They were able to tell me where to tweak it and also give me their timings! This then assisted me in improving where particular things flowed in the run sheet. 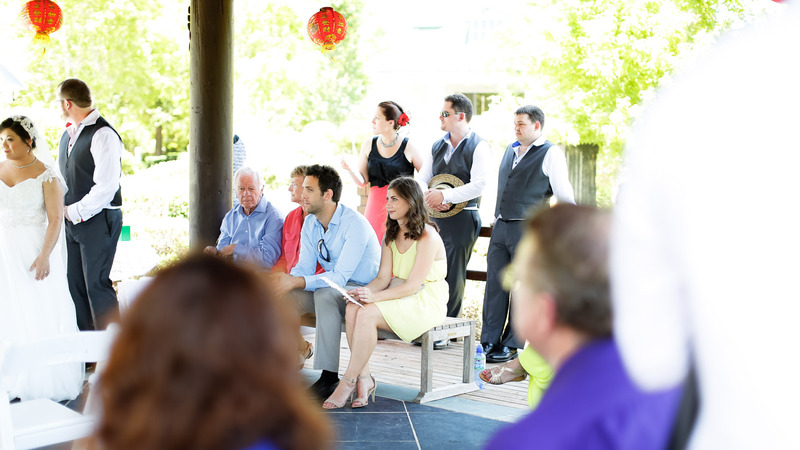 I also went through the run sheet a week early with other attendants (ushers, bridesmaids, etc.) in order for them to understand what I needed of them. If at all possible, print out and give copies to bridal party members: This is particularly important if you have a big group (like we do!). I hope these tips help you all in planning your own run sheet! If you need any tips (or would like to see a copy of my own run sheet), please do PM me! 🙂 I’d post a template up on here, but I need to get cracking to last-minute wedding stuff! Who else had some issues formulating their day-of run sheet? Otherwise known as the “Anti First-Look”. Mr Big and I aren’t really ‘traditional’, but we both really like the idea of not seeing each other the day-of the wedding until we meet each other at opposite ends of the aisle! (Digression, we have a bet going on whether or not Mr Big will cry when he first sees me. I’m really hoping he does, but he’s fervent he won’t!). This means that, the night before the wedding, we’ll wish each other adieu and we’ll be staying in different villas. We still haven’t figured out what we’re going to do, but we’re still trying to figure out if we should grab our own room or bunk with other people (although the second option is looking more and more like a reality). The fact of the matter is we won’t be doing a “First Look”, where the bride and groom see each other before the aisle-walk. 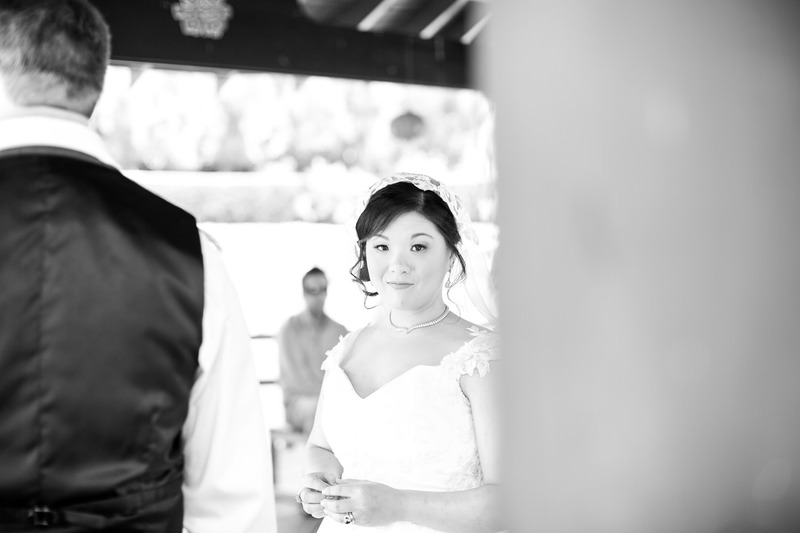 A lot of brides state that it’s special either way, and that’s completely understandable, but given the tradition already infused in our wedding, as well as the timing of the entire affair, the first look just didn’t really fit. Also, I like the idea that Mr Big will not have seen me all day until we’re ready to be joined as husband and wife. ADORBS. Image via Pinterest, photography by Coati Photography. So a part of me really wants pictures like this. Image via Pinterest, photography by Gabri J. Photography. Isn’t it just so frakking adorable? Photography byK. Holly Studios. I’ve asked Mr Big if he liked them, and he actually does. What’s more is because we’ll be getting ready at the same hotel, it works out that we can choose a spot that’s picturesque but keeps me hidden. I honestly think it’s unfair that I get to see Mr Big before he sees me, but as he has to lead me out of the door (remember that Chinese tradition folks? ), it’s just inevitable that I have to have all eyes on that door frame (no tripping for me!). And also, the exchanging of letters the day-of? I’d love to do that too. I love writing letters and to be able to read a letter from Mr Big before we’re husband and wife (and then frame it to hang up in the house somewhere) would be so cute. Also, we’re not really doing a gift-exchange since we’re already giving heaps of other gifts to other people, so a letter would be a nice touch.